Recently I purchased a Sew Steady table for my BERNINA 780. I had walked by their booth a couple of times at Market and was intrigued. 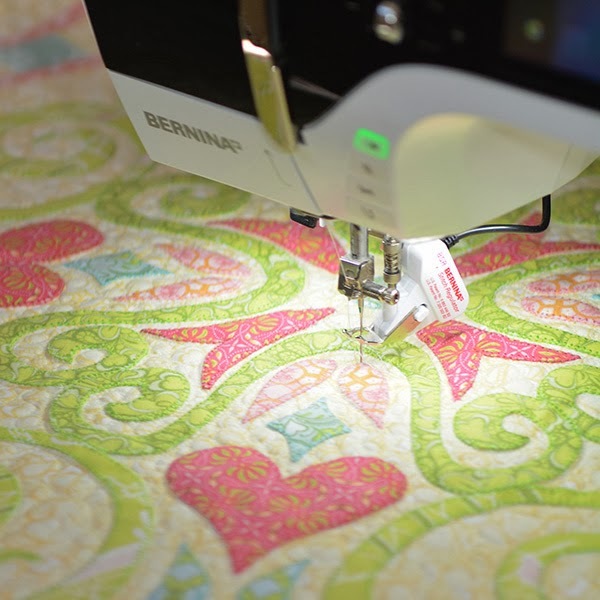 Their tables enlarge your elevated sewing space quite a bit, making for easier piecing and quilting, and they are portable. Of course, in an ideal situation we would all have a full size cabinet-sized table with a sunken place to put our machines but - well, I don't know about you - personally I work in the middle of everything. My workspace is constantly changing; I may have the sewing machine out one day and a graphics tablet the next. It is one of the things that I love about my job, but, in a limited space shared with family it can be a challenge. When you order a Sew Steady table you need to specify the machine you work with. 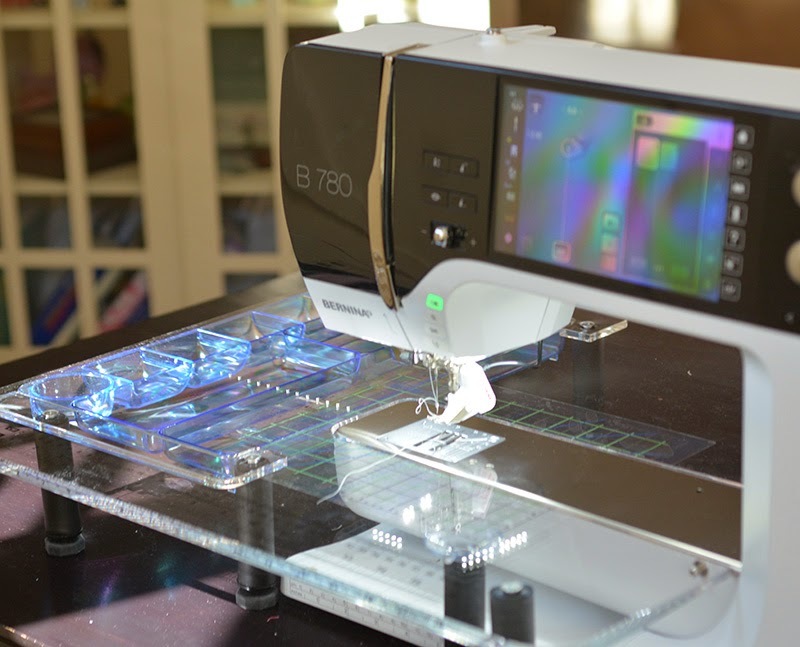 I vacillated between ordering one for my BERNINA 580 and my BERNINA 780, but in the end I chose the 780 because I quilt on it more regularly. When the table arrived I assembled it and mounted it on the machine. At first the left side of the table, near the needle, was a little too elevated and the right side near the neck of the machine, was a little too low, but I called Sew Steady and this was easily remedied with a slightly shorter set of legs. the plastic. It has special markings for 1/4" seams. I was really excited when I got to try the table for the first time this weekend. I knew it would make quilting larger quilts a bit easier, but I was surprised how much easier it made smaller pieces, like pillows or table toppers. Virtually the entire piece fit on the table so there was no drag. Of course, if you were quilting larger pieces you would still want to make sure you had plenty of space behind and the the left of the machine to take the weight of the quilt, but the table does make things easier. Verdict: If you are someone who always dragging your machine around the house with you like a security blanket like me (haha) Sew Steady's extended (but still portable) space might be something you would want to consider. Oh, I almost forgot, for you organized sewers out there there is a drawer underneath the table to hold scissors and pins etc. I need to train myself to use this because I'm a train wreck when I sew and have always have to pick up my mess at the end of the day. Very nice Amanda!! I like the idea of the grid. Myself; I have the Sew Adjustable table...it will fit any machine. It doesn't have the grid though...but works great too. Thanks for the review. I didn't know about the grid underneath the table, but I can see how that would be really helpful for day-to-day piecing--another plus. Thanks so much! 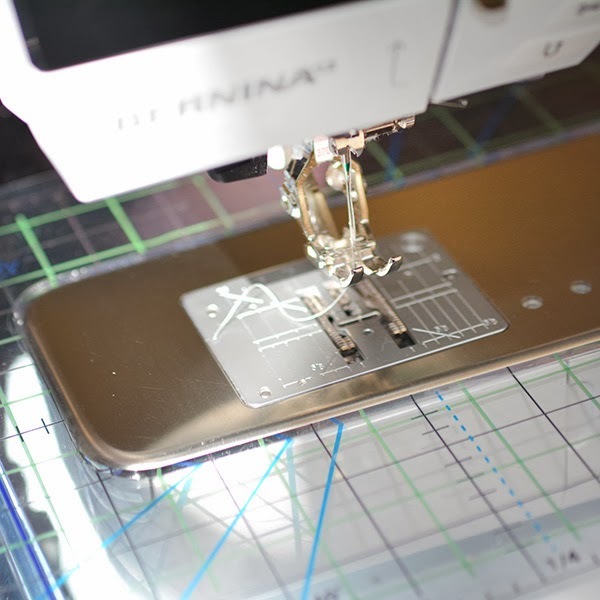 I am a Bernina girl too and have been looking for something like this.